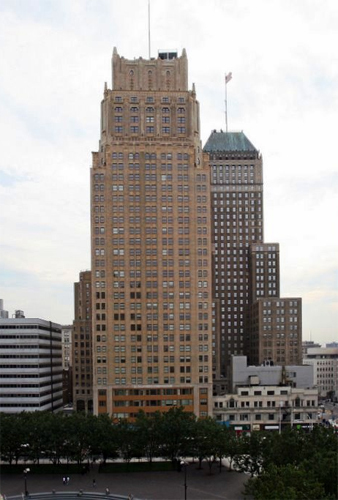 This redevelopment project turned a decaying art deco office tower into luxury rental apartments, constituting the first new luxury housing built in downtown Newark in more than 45 years and promising to help mark a new era of vitality and economic activity for the state’s largest city. Those signs are already fully under way: Within a block of Eleven80, new delis and restaurants have opened, and plans are in progress for a public plaza and park to provide direct pedestrian access to the Prudential Center from Penn Station, in addition to a planned hotel, loft apartments and other restaurants in the immediate area of the arena. Designed by Frank Grad, a prominent Newark architect, the Raymond Commerce Building opened in 1930 as the Lefcourt Newark Building. The 35-story building and its neighbor at 744 Broad St., the National Newark Bank building, were considered Newark’s “Art Deco Twins” and remained the tallest buildings in New Jersey until the late 1980s. The buildings fell into disrepair during that decade and remained empty for 20 years—constant reminders of the city’s economic decline. The abandonment took a toll on the Raymond Commerce Building and caused severe damage both on the inside and outside; entire floor plates had rotted through, pieces of the façade were falling off and there were contamination issues. Cogswell Realty Group, a New York City developer, took a leap of faith when it purchased the buildings in the late 1990s. After a six-year effort to secure the financing for the redevelopment project, Cogswell spent two years undertaking the building’s restoration. This included correcting more than 4,000 problems on the building’s façade and reconstructing its interiors. The building reopened as Eleven80 in 2006. Today it consists of 317 luxury one- and two-bedroom rental residences, renting at prices below the New York City, Jersey City and Hoboken markets. The building features amenities including a health club, bowling alley, basketball court and media room and offers a free van service to the grocery store, train and airport. The over 330 residents who currently live in the more than 235 apartments are very diverse—ranging from private sector employees, to political employees, to civic and cultural and students. Eleven80 takes full advantage of its downtown location and its proximity to cultural and recreational facilities, including the New Jersey Performing Arts Center, the New Jersey Historical Society, the Newark Museum, five universities and the new Prudential Center, which opened in October 2007 two blocks away. Moreover, it draws on its excellent access to various transit systems (Amtrak, NJ TRANSIT, PATH and the Newark light rail/subway) that connect it to the city’s neighborhoods and the region, including Jersey City and Hoboken. For instance, from the nearby Newark Penn Station, midtown Manhattan is an easy 18-minute train ride away. Because of Eleven80’s transit access, only about 100 of the building’s roughly 230 tenants have cars. Participating entities in the project brought vision and resourcefulness to the table when planning Eleven80 in a tough market. Funding for the $120 million renovation was secured from both public (federal and state) and private sources, including federal historic preservation tax credits. The developer emphasized community employment during the construction and hired local residents—more than 400 at the peak of construction—thus generating $1.6 million in salaries for Newark residents. Cogswell is also joining the City and Prudential to redevelop Military Park, which fronts Eleven80. The rehabilitation of the Raymond Commerce Building fosters the city’s vision to create a well-designed, vibrant, livable downtown centered around existing parks, cultural facilities, office buildings and the university community.